I am a member of the Collective Bias® Social Fabric® Community. This shop aboutHow to Grill a Frozen Pizza for A Quick Dinner #DesignAPizza from #Digiorno has been compensated as part of a social shopper amplification for #CollectiveBias and its advertiser. My husband has a video of our extended family ordering pizza and it literally is a 20 minute reel where no one can agree on what type of Pizza to purchase. You end up spending more money adding ingredients to just 1/4 of a pizza to please all the picky pizza eaters in your family. DiGiorno has solved this problem with the Design-A-Pizza kits. Spending family time together should not be stressful trying to appease everyone’s taste preferences. Look what I found at Walmart that will solve the picky pizza eater dilemma, the new Design-a-Pizza Kits from DiGiorno. 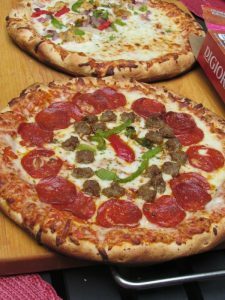 They come in combinations such as Pepperoni & Sausage with Peppers; Chicken, Green Peppers and Red Onion; Spinach, Tomato and Red Onion with Pepperoni. I suggest plating all the ingredients to make designing your pizza much easier. Then gather your guests together and have them design their ideal slices or pizza to meet their tastes. This is the fun part of this pizza kit, everyone will be happy to have their individual say on what they will be eating on their pizza. Heat the Grill to about 350 degrees, I made the mistake of not doing this with indirect heat but I would definitely recommend this technique after doing this trial run. Place the pizzas on the grill. Check them after 15 minutes to be sure they are not burning on the bottom. We used this handy Pizza tool to help get the hot pizzas off the grill. The cheese melted so nicely. Then place on a large cutting board in the middle of your table for centerpiece and everyone can discuss why their piece is the best. 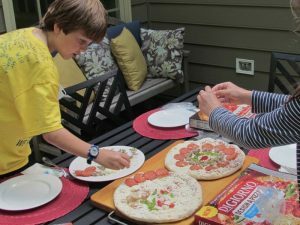 Not only is this an easy way to entertain kids and friends, but you don’t have to worry about fussy Pizza Eaters again. 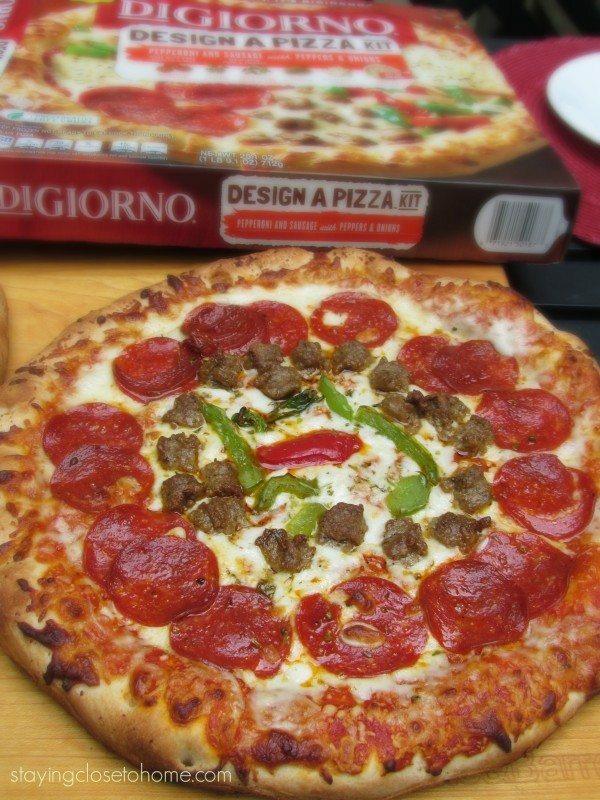 Which DiGiorno Design-A-Pizza would you first try? These sound awesome so everyone gets the toppings they like. I love grilled pizza. Oooh! That’s definitely something I haven’t seen and would be fun for the kids! We get DiGiorno all the time and have never done this. I always put extra toppings on them so this would be great. I keep hearing about these Design a Pizza kits. I’m going to have to pick some up. And I can’t believe I’ve never had a grilled pizza. I’ve gotta try this! WE love this brand, I like how they package all the toppings separately so that everyone can put on what they want. Love their pizzas and this kit looks fantastic. Fun! We love DiGiorno! What a great idea to be able to customize your own slices! Love DiGiorno pizza. The prices are excellent and the taste doesn’t feel like the price. I’ve never tried the Design a Pizza before. Ooh, yummy. We definitely need something like this in our house. We all like something different (and that usually means mom gives up her slice. ) Boo. I buy the Supreme Rising Crust by DiGiorno, quite frankly I am not taking the time to design my frozen pizza! They are my go to when I’m too lazy to order takeout, so I’m probably not going to be designing my own, but I do already love DiGiorno! I love their pizzas! They are soooo good! I’ve never seen that ‘design a pizza’ – how fun! I’m going to look for it next time I go grocery shopping! I haven’t seen this kits yet, but I’m definitely going to be on the lookout for them. My kids all want different toppings on their pizzas and this seems like the perfect solution. I actually just saw these today and thought about trying it! Unfortunately, it’s a bit out of my price range. Still a fun idea. How Cool Is This My Kids Will Love This And It’s Our Favorite Pizza! 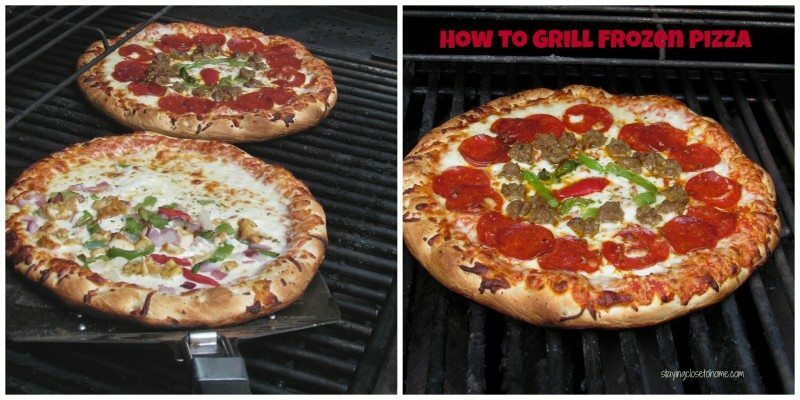 I didn’t know digiorno had make your own pizzas…and I love grilling pizza! 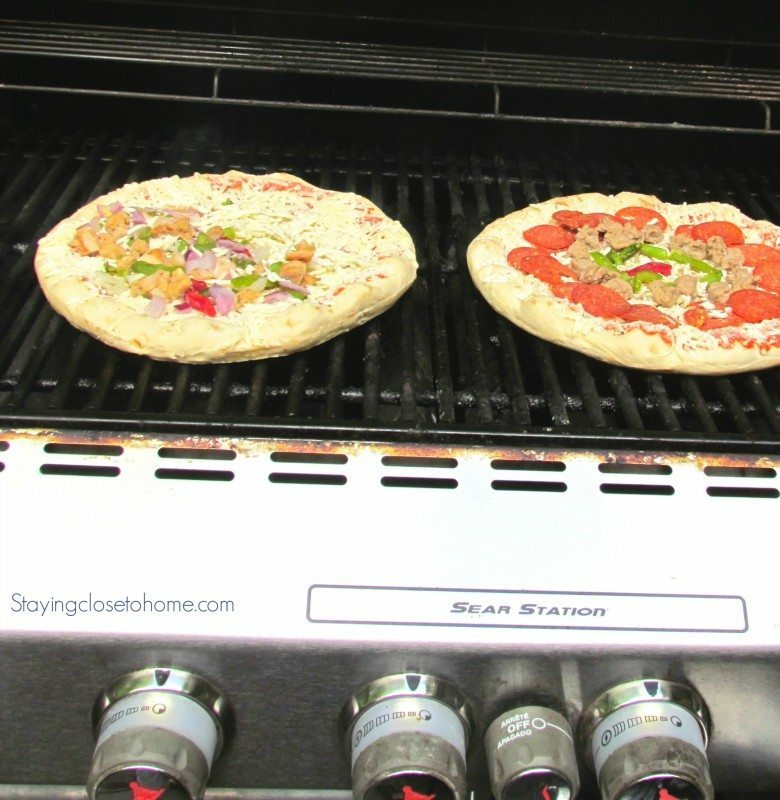 We love grilling pizzas! DiGiorno is the best frozen pizza out there, too!